I know us “oldies” always complain about how quickly time passes by, but it’s incredible to think that this is the 24th Melbourne AGP and I can still clearly remember the first one back in 1996 when Steve Richards raced in a VR Commodore for GRM and finished 6th behind V8 royalty in Peter Brock. It really is fitting for such a Champion that Brocky was that he won the first AGP Supercar round. The AGP event is certainly that, an event! Joey had to be in at the track on Tuesday morning with the transporter and the race crew left our Dandenong South headquarters Wednesday morning to set the garages up. I dropped past the track on Wednesday afternoon and it was a hive of activity with car displays being erected, F1 containers being delivered and unpacked, food stalls arriving, television crews from all over the globe setting up base, sign writers touching up track signage and the list goes on. Excitement and anticipation were certainly in the air and although I have been doing this for 55 plus years, I still couldn’t help getting caught up in all the excitement. Melbourne does an incredible job when it comes to major events like this. The organisation and presentation of the Albert Park facility and surrounding areas is something that we should all be very proud of. Thursday and the track action begun. The Supercar schedule was 2×30 minute practice sessions followed by 2×10 minute qualifying sessions. The AGP Melbourne 400 consists of four races, 2×25 laps (130km) and 2×13 laps (70km), each with individual qualifying. Following practice Richie and James were in a familiar position 18th and 19th. The pace was set by Scott McLaughlin. Qualifying was a similar story over the weekend with Scotty dominating in the Mustang and our cars in the mid to high teens. On the Thursday evening the Governor of Victoria invites team personnel to a welcoming at Government House. Over the years I have never taken up this invitation as I feel much more comfortable having a pot at the Longwarry pub. But this year I thought I would attend and although the formalities on these occasions can be a little long winded, I did enjoy listening to Jean Todt (President of the FIA) who has had a lifetime in Motorsport. Like many Melbournians I haven’t taken the time to look at many of our landmarks and Government House and the surrounding gardens are certainly one worth visiting. I know that I usually go into quite some depth in my Race Report with regards to each race, but from a GRM point of view there were very few highlights worthwhile discussing. To be frank our performance over the weekend was embarrassing for all at GRM and we are certainly working hard to close the gap to those leading the way, yet there were some positive indicators that on the surface are not all that evident. Scott McLaughlin’s best qualifying lap in 2019 was 0.78 sec quicker than his 2018 best (both were pole position laps), James Golding improved 1.19sec year on year and Richie was 1.74 sec quicker year on year. But the fact is we are not quick enough. The weekend was dominated by Scott McLaughlin who won 3 out of 4 races with his only blemish resulting in a DNS (did not start) in Race 2 of the weekend when he and Cam Waters (Tickford) came together on the out lap. Race 1 of the weekend was the best result we had with James 16th and Richie 17th with both drivers either receiving penalties or being on the wrong end of other drivers’ misdemeanours in each of the other races. Richie spent some time in the steward’s office over the weekend with the major incident being the on-track clash with Lee Holdsworth (Tickford). I am not one that partakes in social media activity, but I am well informed that both Richie and GRM (particularly myself) have been central in a lot of discussion with much of it negative. I have absolutely no problem with that as I am a believer in freedom of speech so long as derogatory language is not used. As an 18-year-old I began GRM (1963) and have done things my way ever since. Richie Stanaway is a very, very accomplished Motor Racing driver and to his credit he backed himself to leave New Zealand in his late teens and travelled to Europe with no money but plenty of desire. He had some remarkable successes and although his dream was to race in F1 did not eventuate he at least gave it a go. To date as full-time Supercar driver Richie has not delivered, but that doesn’t mean we all give up. What it does mean is we all work harder and harder. I won’t go into the details of the Stanaway/Holdsworth incident over the weekend, but one thing I did learn was that Richie Stanaway is not a whinger, he gets on with things. I certainly do not condone “dangerous driving” but I do encourage good old-fashioned hard racing where you fight tooth and nail and don’t get “bullied”. I am seriously over the “café latte/bike riding” set of drivers who are all buddy, buddy. 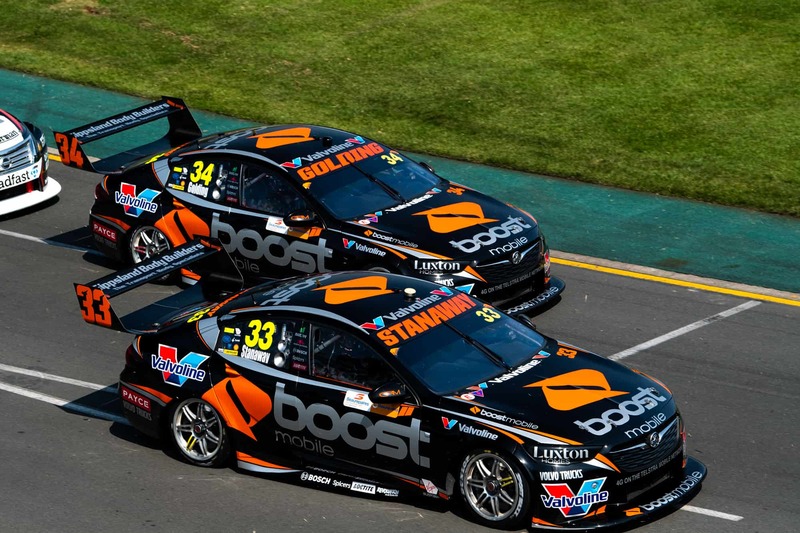 Teams and sponsors are spending enormous amounts on money to put on races not processions, the facts are victories in Supercars are a tough gig and drivers need to fight hard for every position. As a sport we need to get fair dinkum, because vanilla is boring!! Over the weekend we spent considerable time in the Steward’s office, yet I must commend Craig Baird (Driving Standards Officer) on his approach and in depth understanding of racing. Yet, Craig can only adjudicate according to the set of rules put in front of him. It is absolutely paramount that we remember that Motor Racing is an entertainment sport, and although incredibly dangerous and rules must be in place for safety, we MUST focus on the entertainment side. On a positive note it was absolutely terrific to see the enormous crowd of in excess of 300,000 fans attend the GP over the weekend. Well done Melbourne! MOMENT OF DISAPPOINTMENT – time spent in the Steward’s office. MOMENT OF EXCITEMENT – making it to the Longwarry pub on Sunday afternoon! I can’t wait for Tassie!